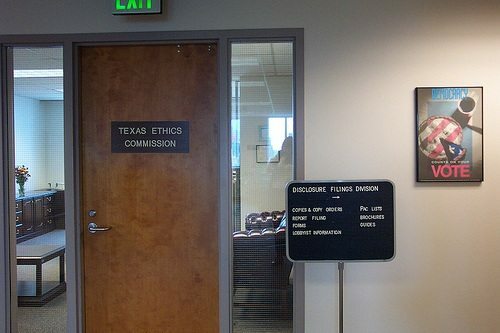 There may have been some confusion regarding nonprofit ethics in Texas in the wake of a controversial draft opinion from attorneys for the state’s Ethics Commission. The draft opinion would have barred legislators from heading any nonprofit organization if they also solicit contributions for that agency. Commissioners balked and tabled the measure but reportedly planned to revisit it this week. According to the Texas Tribune, Ethics Commission Vice Chairman Jim Clancy, who was appointed by Texas Gov. Rick Perry, articulated a concern over the realities of community involvement in a part-time Texas state legislature in a November discussion of the issue: “We pay our legislators, what, $6,000, $7,000 a year? If we’re going to have a citizen legislature, they’re going to be involved in stuff.” Clancy noted that the tabled provision is being brought back before the Commission for a vote but it will not include the language that would prevent legislators from doing nonprofit “stuff” while fundraising for a nonprofit and serving in the legislature. Clearly, the Commission attorneys who authored the original opinion believed that working for and shilling for a nonprofit while serving in the state legislature could lead to the appearance of impropriety; for instance, could a donation to a nonprofit that a legislator is working at and raising money for be viewed as an attempt to buy influence with that legislator on some issue that he or she may vote on? The attorneys who wrote the original draft opinion felt that such a possibility “could reasonably be expected to impair” the legislator’s “independence of judgment” in such a situation. Louis Altman is a Vocational Rehabilitation Counselor with the Syracuse, New York office of ACCES-VR, a state agency that works with people with disabilities to help them achieve vocational goals and other related objectives. A licensed attorney in New York for over twenty years, Louis is also an adjunct professor at the State University of New York at Buffalo, teaching Legal & Ethical Issues in Counseling for the University's masters program in Rehabilitation Counseling, a program he graduated from. Louis has been writing newswires for NPQ since 2012. He has a wide variety of interests in the arts, business and sociology, and whatever unique and influential developments NPQ readers might find valuable to know. To leverage his training and experience he is working with NPQ to develop a focus on legal and vocational issues relevant to the nonprofit community.